“So, why didn’t the Church arrest him?” Kathryn interrupted, slightly impatient at Luberon’s lugubrious tone. 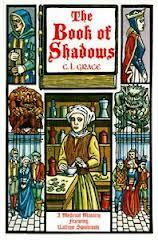 The Book of Shadows is the 4th in a series of medieval mysteries featuring Kathryn Swinbroke, and written under a pen-name by Paul Doherty, author of the much better known Brother Athelstan and Hugh Corbett series. It was this one which happened to come my way and I will review it here, but I see that the hardback (which I have in my hands) is hard to find and buy and the Kindle edition is “not currently available for purchase” (and nor are any others in the series). Doherty is clearly not a Yorkist! In the Prologue, we meet Tenebrae, “the great magus or warlock”, a practising satanist who in fact makes his money by means of blackmail. And in that kind of post-civil-war situation, when all those who had supported the other side went in fear of their lives, blackmail was obviously a very lucrative trade. It turns out that Tenebrae had a large book, the Book of Shadows of our title, a copy of the ancient grimoire of Honorius; and in that book was recorded in his own hand all the secret information he had gathered about many of the greatest in the land. Including Elizabeth Woodville, King Edward’s beautiful and ruthless queen. Meanwhile, in a sub-plot, an old lady is accused of bringing about a rich burgher’s death by using witchcraft, and is to be burnt. Can Kathryn save her? I have to say that so far as I know – and so far as I can discover – they did not burn witches in England at this time, though they did in Scotland and France. In England, they were hanged, or drowned while being dipped on the cuckin/ducking stool. For Doherty fans – I am one, as most of you will know by now – essential reading if you can get hold of a copy. Ascham opened his eyes. the library was dark. He tried again to scream but the sound died on his lips. The candle, flickering under its metal cap on the table, shed a small pool of light and Ascham glimpsed the piece of parchment the assassin had tossed onto the table. Ascham realised what had brought about his death: he’d recognised the truth but he’d been stupid ebough to allow his searches to be known. If only he had a pen! His hand grasped the wound bubbling in his chest. He wept and crawled painfully across the floor towards the table. He seized the parchment and, with his dying strength, carefully hauled himself up to etch out the letters – but the pool of light seemed to be dimming. He’d lost the feeling in his legs, which were stiffening, like bars of iron. Ascham closed his eyes, coughed and died as the blood bubbled on his lips. When the book opens, Hugh Corbett is at home in Leighton, in Essex, enjoying his peaceful life as Lord of the Manor, even if that does involve the odd hanging (as on the first page of Chapter 1) which he certainly does not enjoy, though everyone else seems to. But this country idyll is rudely shattered when the King, Edward I, arrives at the manor house demanding that Hugh return to his service immediately. Meanwhile, outside the college, in the city, this Bellman has been posting proclamations attacking the King and claiming that Simon de Montfort was in the right of it when he took up arms against the King. And these proclamations purport to be emanating from Sparrow Hall, which the masters there all fervently deny. Well, they would. Also outside the Hall, another seemingly separate series of murders has been taking place. In each case, an old beggar from the city, by definition helpless and defenceless, has been taken out into the forest and decapitated and his head has been hung from the branches of a tree. Sir Hugh finds reason to believe they were not actually killed in the forest but taken there – from Sparrow Hall, which would link them in some strange way with the Bellman and the murder of the two masters. 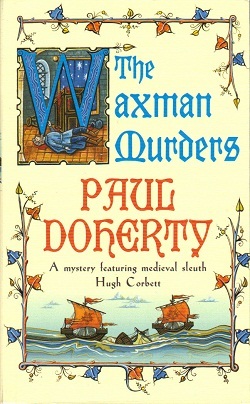 Another perfect medieval whodunnit from Paul Doherty. Not a word is wasted, and the excitement never flags for a moment. Nor can one possibly guess (without cheating!) who the Bellman really is. ‘It was murder, wasn’t it?’ Ranulf asked sitting down on a stool. Corbett pursed his lips. Ranulf stared in disbelief. Chanson, delighted, stood rooted to the spot. He loved nothing better, as he’d often whispered to Ranulf, than sombre tales about witches, warlocks and sorcerers. ‘Yes and no,’ Corbett replied slowly. Another murder in a monastery – this time within a sealed chamber in the Fenland Abbey of St Martin’s-in-the-Marsh. The Abbot, a friend of the King’s (he used to be a warrior and once saved the King’s life), has been stabbed in his own chamber with his own dagger, yet there seems to be no way anyone could have obtained access to him. The monks are about to organise a cover-up, insisting that some outsider, some outlaw, must have broken in and killed the Abbot, but the King (Edward I) is having none of it. He promptly sends Sir Hugh with his henchman Ranulf to make enquiries. They soon discover that the aristocratic widow who owns all the adjoining lands was on very bad terms with Abbot Stephen, refusing to communicate with him directly and arguing fiercely – through the Prior – about a disputed boundary. But is there more to it than this? It turns out that they knew each other – well – when they were young. Meanwhile, inside the monastery, two more suspects lurk: Taverner, a “cunning man” (a confidence trickster, living on his wits) who claimed to be possessed and whom the Abbot had been planning to exorcise; and an arch-deacon from London, an “old friend” of the Abbot’s, who had ostensibly come to witness the exorcism. There is, it must be said, some careless editing, which is very unusual in Headline books (and especially in Paul Doherty’s books!). For example, on p20, Ranulf asks, ‘Did you ever meet Abbot Stephen?’ ‘On a few occasions,’ Corbett replies; on p129, we are informed that “he [Corbett] had never met Abbot Stephen”. What matters to me, always, is that the story grips. It is not a book to read in bed before you sleep. As with all Paul Doherty’s medieval novels, you won’t. You won’t even yawn. In fact, three hours later you’ll be getting up, book in hand to make a cup of tea. In 1272, King Henry III had died. His son Edward was on Crusade in Outremer (the Holy Land) at the time, and, in the absence of a king, law and order broke down. Rifflers pillaged isolated homes and farms. Among those attacked was the Blackstock’s manor house outside Canterbury. The Blackstocks had two sons. The older boy, Hubert, was at school in Canterbury, but the younger son, Adam, watched his own mother being raped and murdered, then saw his father killed and his home burnt down. By the year 1300, Adam had become a North Sea pirate with his own ship, the Waxman, and Hugh, who had pursued his studies and become a monk, had abandoned the cloister and disappeared from sight – though all men feared him as much as they did his brother. A map purporting to show where a great treasure was buried in Suffolk had fallen into Adam’s hands. He was sailing to the Orwell estuary to deliver it to his brother when he was intercepted by two ships and killed in the ensuing battle. The map disappeared. Now, three years later, a series of murders have been committed in Canterbury. 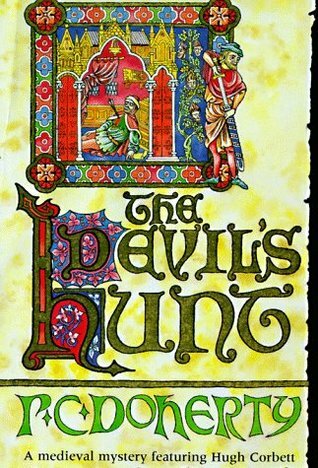 Sir Hugh Corbett, sent by king Edward (whose main interest is the map and the treasure) to investigate, finds that the beautiful lady Adelicia has been accused of one of the murders – the victim was her detested and miserly husband – but he has reason to believe that they are all in fact connected, and may be the work of Hugh, Adam Blackstead’s mysterious elder brother. Then Hugh himself receives a threatening note – from someone who seems to be able to kill with impunity, anywhere, any time. 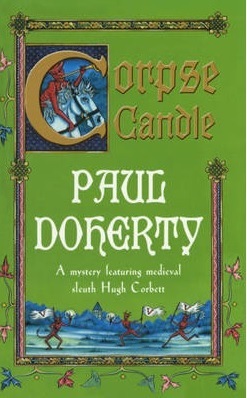 As I have said before, and will no doubt say again, Paul Doherty is the maestro when it comes to Medieval Mysteries, and this is another one not to be missed. In his cold, cramped cell in the monastery outside Worcester, Florence the chronicler lifted his milky, dim eyes and stared out at the darkness beyond his cell window. How should he describe these times? Should he recount all that he had heard? Was it true for instance that Satan himself, the prince of darkness, had reisen from the depths of hell with his horde of black-garbed legions to tempt and terrorise the human soul with visions from the pit? He had been told that an evil sea of demons, rumbling and boiling over the face of the earth, amused themselves disguised as snakes, fierce animals, monsters with crooked limbs, mangy beasts and crawling things. At midnight, so Florence had heard, the heavens rumbled with thunder and lightning flashed above a restless sea of heads, hands outstretched, eyes glassy with despair. In the dark streets and alleyways of Paris, which ran together in a spider’s web on the far side of the Grand Pont, more practical men laid their schemes and drew up plans to discover Philip’s true intentions. Sir Hugh Corbett, Edward I of England’s most senior clerk in the chancery, master of the King’s secrets and Keeper of the Secret Seal, had flooded the French city with his agents: merchants osensibly looking for new markets; monks and friars supposedly visiting their mothr-houses;scholars hoping to dispute in the schools; pilgrims apparently on their way to worship the severed head of St Denis; even courtesans who hired chambers and entertained clients, the clerks and officials of Philip’s secret chancery. Two more of Paul Doherty’s Sir Hugh Corbett novels have recently come my way. 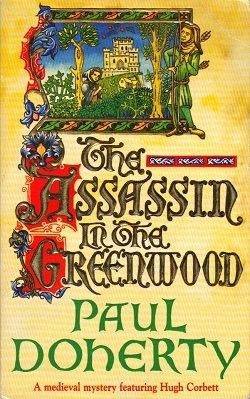 Both are excellent – of course – this is Paul Doherty – but I especially enjoyed The Assassin in the Greenwood. I imagine this was because it features such familiar characters as Robin Hood, Little John, Will Scarlett, Maid Marian and, of course, the Sheriff of Nottingham, the evil Sir Guy of Gisborne. But – this being Paul Doherty – it is not as simple as Hugh Corbett meets Robin of Locksley and we all have fun in the greenwood. Far from it. The book opens with the other plot. Philip the Fair of France is planning to invade Flanders, an important ally of England’s (the wool trade!) while Edward of England is engaged in his ongoing war with the ‘rebellious’ Scots. As England and France are officially at peace, Edward cannot interfere directly. What he can do, though, is learn exactly when and where the French army will cross the border, and inform the Flemings. Ranulf, Hugh’s right-hand man, is in Paris with a team of spies trying to find out just that. Meanwhile, in Nottingham, Robin Hood, who had made his peace with the King and retired to his estate, suddenly takes to the woods again, where he, Little John and Maid Marian begin robbing and killing with a ruthlessness and ferocity they had never shown before, including seizing the King’s own taxes en route to London and killing all the soldiers who were guarding it. Then the Sheriff of Nottingham himself is poisoned during the night in his locked room. Sir Hugh is sent to Nottingham and Ranulf joins him there with a document supposedly containing the information Edward is waiting for. But it is in code and they cannot break the code. Then Hugh receives a message from London telling him that Philip has despatched an assassin to murder him. The assassin, who might be anybody, is already in Nottingham. As always, the minor characters are a joy. Take Henry de Lacey, Earl of Lincoln, the King’s cousin. How would you picture him after reading about him in the history books? Ah, but after reading this book he will be there vividly in your mind for ever – and all from one brief appearance. 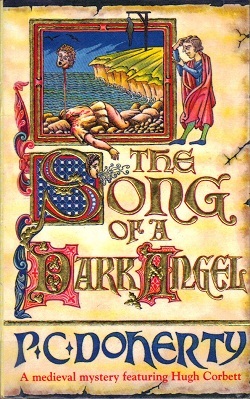 The events recounted in The Song of a Dark Angel take place as winter sets in later in that same year, 1302. On a beach near Hunstanton in Norfolk, where the wind sweeps in off the North Sea all winter long (the Dark Angel of the title is the local name of this north-east wind), a headless corpse is discovered. The missing head has been impaled on a pole, and hanging on the gallows nearby is the body of the wife of the local baker. But why has the King sent Sir Hugh and Ranulf to investigate what seem on the face of it two quite ordinary, if violent, deaths, one of which may have been a suicide? Can it have anything to do with the fact that the King’s grandfather, Bad King John, lost all his treasure in the Wash when the treacherous tides swept in faster than anticipated? And that certain items from that lost treasure have recently surfaced in a London pawnbroker’s, and that the present King is strapped for cash? 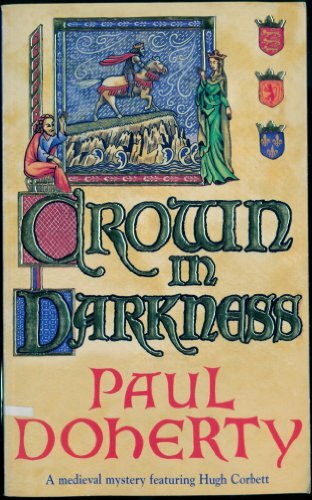 Another great tale by the inimitable Paul Doherty, full of unexpected twists and turns and the usual unforgettable medieval characters. This is the fourth and in some ways the best yet of Doherty’s series of novels based on Chaucer’s Canterbury Tales. 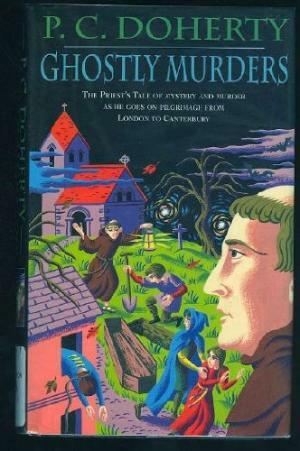 Ghostly Murders is in fact the Poor Priest’s tale (his other tale) a ghost story in which two brothers, both young, both priests, get caught up in the aftermath of a horrifying crime involving some Templars who were fleeing for their lives at a time when all the world had turned against them. But of course, before that tale can begin, the pilgrims must settle down for the night. And this particular night they find themselves caught in an evening mist close to dangerous marshes on which they can see lights (“corpse candles”) flickering in the growing darkness, so they decide to stop in a nearby village. Only the village is deserted, and has been since the Black Death thirty years earlier, and not only deserted but downright eerie, and not made any less so by the pilgrims themselves. The Miller gave a loud fart in answer, making the Carpenter snigger and giggle. Nevertheless, the pilgrims grouped closer. The Summoner moved his fat little horse behind that of the Franklin. He was not just interested in the Franklin’s costly silk purse, white as the morning milk. Oh no, the Summoner smiled to himself: he, like some others, was increasingly fascinated by this motley group of pilgrims making their way to Canterbury in the year of Our Lord 1389. All seemed to be acquainted with each other and the Summoner definitely knew the Franklin. They had met many years ago on a blood-soaked island. He was sure of that, as he was sure that the Franklin had had a hand in his father’s death. He would have liked to have talked to his colleague the Pardoner but he was now suspicious for the Summoner had recently discovered that the Franklin and the Pardoner were close friends. Indeed, this cunning man, with his bag full of relics and the bones of saints slung on a string round his neck, was certainly not what he claimed to be. Behind the Summoner, the Friar, nervous of the cloying mist, plucked at the harp slung over his saddle horn. As he played, the Friar glanced furtively at the Monk riding alongside him. The Friar closed his eyes and strummed at the harp strings, calling up a little ditty he had learnt, anything to drive away the fears. He did not like the Monk sitting so arrogantly on his brown-berry palfrey: that smooth, fat face, those dark, soulless eyes and that smile, wolfish, the eye-teeth hanging down like jagged daggers. 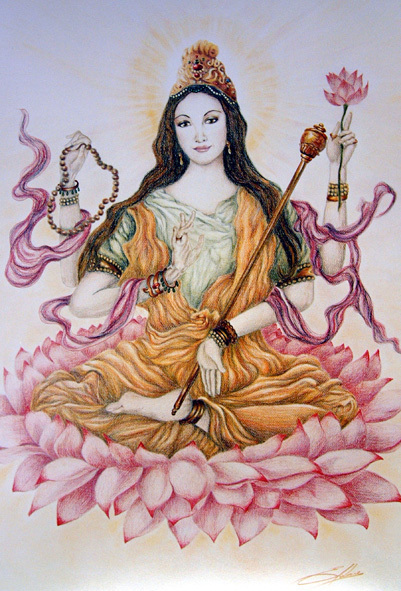 Who was the Monk? Why was the Knight so wary of him? And the latter’s son? The young, golden-haired Squire, he always kept an eye on the Monk, hand on the pommel of his sword, as if he expected the Monk to launch a sudden assault upon his father, the Knight. Was the Monk, the Friar wondered, one of those strigoi mentioned by the Knight in his tale? Did the Monk belong to the Undead? Those damned souls who wandered the face of the earth, finding their sustenance in human blood? The whole setting reminds the Poor Priest of another Kentish village, Scawsby, and when prevailed upon to tell a tale he tells them of the strange events in Scawsby during his time there. In fact, he tells them, it had all begun much earlier, in 1308, in the reign of the present king’s grandfather. A group of Templar Knights, fleeing from London to the coast, had been lured into just such treacherous marshes on just such a misty evening and there, mired and helpless, set upon by robbers led by the local lord of the manor and the parish priest, intent on seizing the Templar treasure. An arrow whipped out of the darkness and took him full in the shoulder. As if the ghosts were not enough, there is also an attack on the village by a band of French marauders. But why on this small inland village? Can they too be after the Templar treasure? Another of Doherty’s seemingly inexhaustible stream of wonderful minor characters makes an appearance in this book: the coffin woman. Read it, if only for her! She is old and seems to know more about what happened seventy years ago than she is telling. What was her part in all this, wonders Philip. The tension builds as Doherty skillfully blends his three story lines: the pilgrims, Philip and his brother, and their predecessor Romanel. But unlike Romanel, the Poor Priest is not interested in “treasure on earth”. Will he therefore prove immune to the evil that has corrupted the souls of and led to the death of so many others?